St. Louis Park had an actual movie palace, as elegant as the ones downtown. 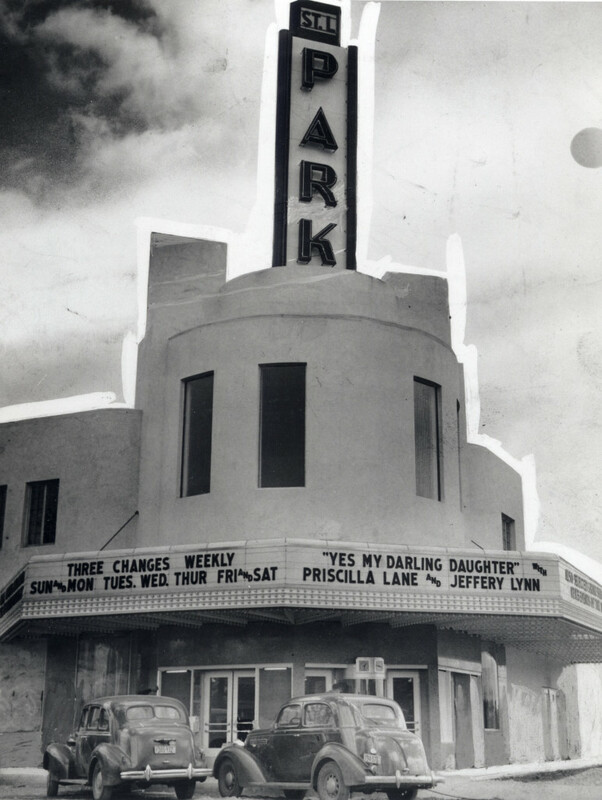 The Park Theater, originally to be called the Center Theater, opened at 4835 Minnetonka Blvd. on May 10, 1939. The Minneapolis Tribune reported that opening ceremonies includes a color guard by the American Legion and fireworks between shows. The first movie shown was “Yes My Darling Daughter” with Priscilla Lane and Jeffery Lynn. A little blue Crosley car was employed to shuttle patrons from the parking lot to the theater. An authentic movie palace, it featured a modern decor (“art moderne” – “The Theater of Tomorrow”) and opulent appointments. It seated 1,102 patrons, with a balcony where smoking was allowed. Seats were staggered to ensure maximum sightlines. At the end of every other row was a double seat, apparently for those not on their first date. The entrance opened to a circular lobby, into a spacious foyer. 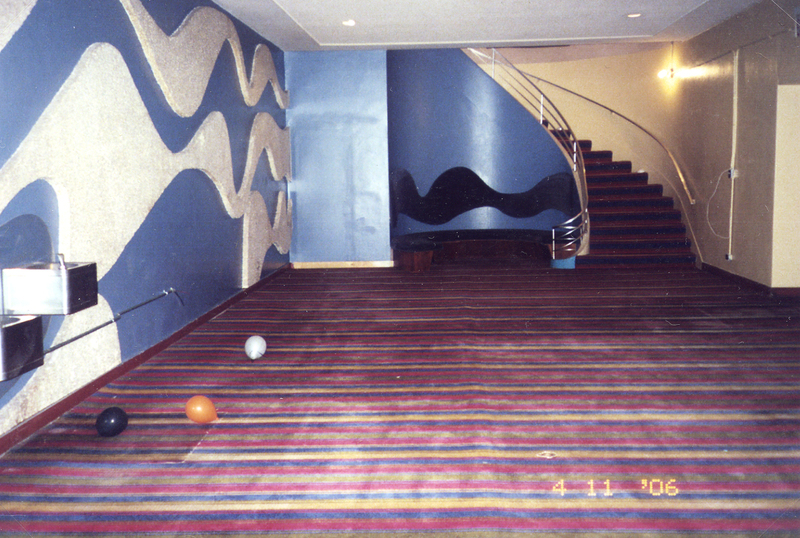 The lounge was decorated with “surrealistic” wallpaper. The basic color was metallic gray, with “aluminite” walls. The rest of the color scheme was red, green, and yellow, with indirect lighting. A Mrs. Clow of the American Institute of Decorators created the interior. The building featured one of the first uses of fluorescent lighting. Seats were covered with bright red mohair. The land was purchased from farmer Simon Kruse. Of the 27 acres purchased, 10-15 acres were donated for Carpenter Park, which later became the site of the St. Louis Park City Hall. Personnel included the architect, Perry E. Crosier; the builder, M.E. Greenberg Construction Co.; and the owner, the Minnesota Amusement Co., Harold D. Field, President. Field was the son of M.L. Finkelstein, who owned several theaters in Minneapolis. The manager was Harold Kaplan, who had managed four Minneapolis theaters in the past and also operated the Texa-Tonka Liquor Store. When Kaplan died on June 15, 1956 at age 48, he was described as “St. Louis Park’s #1 Citizen” by the Dispatch. The building also included four stores on the ground floor and office sites on the second floor. In 1953 the theater closed as it sued the Minnesota Amusement Co. and eight major movie production companies for fixing “runs and time clearances.” The Hollywood Theater in Minneapolis was also a party to the suit. In a 1956 interview with Will Jones in the Minneapolis Tribune, owner Harold Field called kiddie cartoon matinees the salvation of the movie business, saying that kids would rather go out to a movie than sit home and watch TV. Although he called the theater a baby-sitting service and wished more parents would come to keep control, he didn’t seem to mind the chaos. Harold and his son Martin catered to kids, with gimmicks such as King for a Day and Queen for a Day, where the kid who finds a king or queen slip in his popcorn box gets all he can eat and drink that day and tickets for 10 more movies. They also played host to as many as eight or nine birthday parties in one afternoon, reserving seats, singing “Happy Birthday,” and providing party hats and favors. In August of 1957, the Theater was held up. The photo below is of owner Martin Field counting his losses. In 1958 there was a major redecoration effort. The goal was to make the moviegoer feel NOT at home, but in an elegant night club. It was at this time that 70 mm projection equipment was added – only the second in town after the Academy Theater downtown. 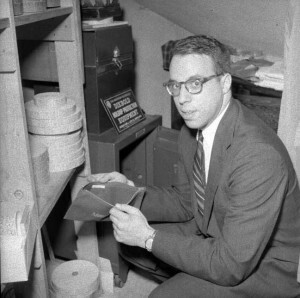 In August 1958 Harold Field booked Minneapolis Tribune columnist Will Jones to emcee a kids’ talent show at the theater. It was billed as the first “kiddie revue” to be staged since 1931 when Field staged the original series of shows at the State Theater. Follow the link above for all the details. In the late 1950s there were a couple of plans for the adjacent land south of the Theater, bounded by Highway 7, W. 31st Street, Ottawa, and Carpenter Park. In 1958, Field, Max Winter, and Cedric Adams, Jr. proposed to build a restaurant on the site. In 1959, a request was made by Harold Field, Jr., Mr. and Mrs. Harold Field, Sr., and Norman Moshu, the proposed builder, to build a St. Louis Park Theater Company, perhaps on par with the Guthrie. They requested the zoning to be changed from commercial to unrestricted, with a mind to build up to six stories. To no avail: an apartment building was built on that site in 1961. In 1963 Ted Mann of Mann Theaters took over the Park Theater. He also owned the Mann Southtown, Downtown Mann, Academy, Orpheum, Uptown, Downtown World, and Suburban World Theaters. Under his watch, most of these theaters went into disrepair. In July 1963 Mann sent Martin Field to Washington, DC to oversee Mann’s holdings there. In 1965 Mann remodeled the Park Theater for the conversion to Cinerama, in order to compete with the Cooper. 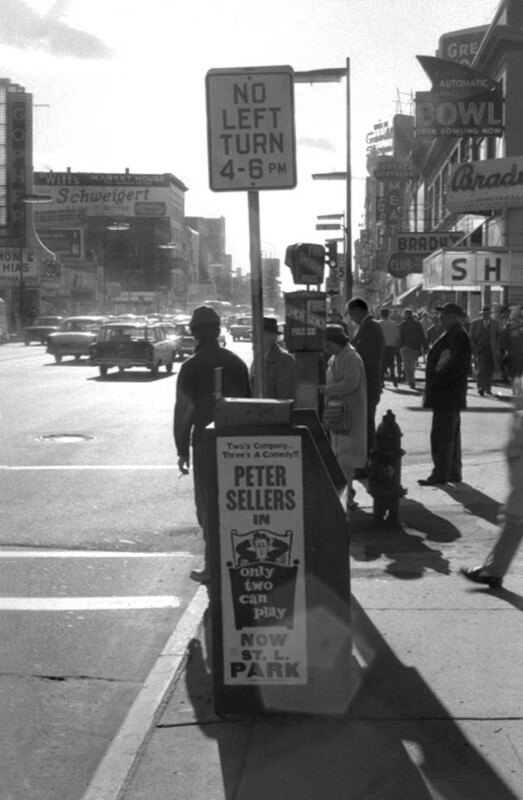 The theater closed on November 28, 1965. Plans were to install “rocket-type” seats, and to move the projection booth from the balcony to the main floor. The Architect was Gingold-Pink, Minneapolis. On June 1, 1977, the theater began showing the movie “Star Wars,” and neighbors remember that the surrounding streets for blocks were filled with cars every night for weeks. The movie bore seeing more than once – in fact, the theater kept showing it until January 1979. The theater closed for good on May 18, 1980. The last showing was a double feature: “Casablanca” and “Play it Again, Sam.” At the time the theater was leased by Engler Theaters Inc. of Hopkins from Mrs. Harold Field. The auditorium was razed to make room for Menora Plaza, an eight-story apartment building for the elderly developed by the Minneapolis Federation for Jewish Service. 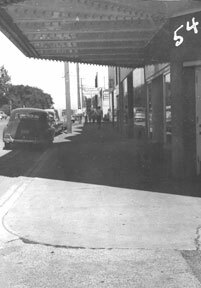 The theater building still exists today with stores and offices. But in 2006, remnants of its former glory were all around, from the original light fixture in the lobby, torn and tattered but original carpeting and wall treatments in the foyer, projection room, sweeping stairs to the balcony, original tile in the bathroom, , and two foyer doors that usher you into… nothing, since the auditorium itself was removed for a parking lot. Above: Stairway up to balcony. Auditorium was on the right. The spaces you see above have since been renovated and very little exists of the old Park Theater. For more on the Park Theater, see Something in the Water.